Vosene Medicated Original Shampoo contains a select blend of deep cleansing ingredients that helps to maintain the natural protection of your scalp from the first use. It is suitable for all hair types and is recommended for daily use. Vosene medicated Shampoo leaves hair healthy, clean, soft and manageable. Its active ingredient Salicylic Acid helps to effectively prevent dandruff when used on a regular basis. 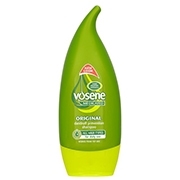 Vosene Medicated Original Shampoo now has a brand new modern and appealing unique tear drop design on the outside but is the same unchanged trusted formula inside. This active formula has also been dermatologically tested. Vosene has been helping to keep hair and scalps healthy and clean since 1949 and is trusted by generations of families.